While planning my trip and getting all the boring stuff out of the way — vaccinations, travel insurance and clothes shopping for the Amazon (ah yes, important still to look chic without getting ravaged by mosquitoes), I have been reading up on the history of cocoa and its different varieties. 1. Theobroma cacao is the scientific Latin name given to the cacao trees that are native to the deep tropical region of the Americas. 2. The difference between cacao and cocoa: Cacao is the bean. Cocoa is the product that is made from it. 3. Cocoa trees need to be planted next to tall trees in order to protect them from direct sunlight. This is why you often see cocoa trees planted amongst mango and papaya trees. The soil (or terroir, as in wine-making) influences the flavours of the cocoa beans. 4. Cocoa trees need to grow in hot and damp climates such as are found between the latitudes 20° North and 20° South of the Equator. 5. It takes 3 to 5 years before the cocoa tree bears fruit. EACH TREE produces around 1,000 beans a year, but that is only enough to make just 1 kg of chocolate. So next time you say fine chocolate is expensive, remember this! 6. Every stage of cocoa production is done by hand: planting, irrigating, harvesting, fermenting and drying. Another reason why fine chocolate justifies its price. 7. 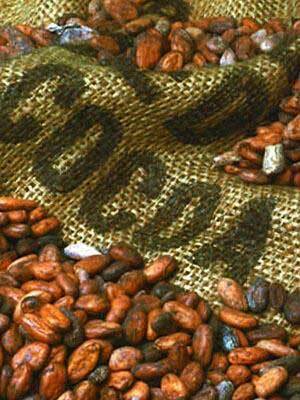 Over 70% of the world’s cocoa comes from West Africa, which provides the bulk of cocoa used for mass-produced chocolate. 8. The UK is the world’s largest “chocolate” consumer with annual average consumption per capita of 11.5 kg. I put chocolate in inverted commas because most of what is sold in the UK contains less than 1% of cocoa: under French legislation, it would be illegal for it to be called chocolate. Vivent les Français for protecting quality foods! 9. Amsterdam is the world’s most important cocoa port: 500,000-600,000 tonnes of cocoa go through the port each day. 10. Last but not least, there are three different main cocoa varieties: Forastero, Criollo and Trinatorio. As this is an important part of chocojuju’s cocoa tutorial, I will be dedicating a new post to this topic. Thanks Juliette. I think your points about how relatively expensive it is to produce high-quality chocolate are spot on. It is mostly likely to be the forastero variety. Can you grow cocoa in Florida? Which is the most popular variety? Which is the most popular variety of cocoa?